When you have a pesky rug or carpet stain, the most important thing to remember is not to use any harsh chemicals. Most of the time, the formulas for carpet stain removal that are being sold in stores are intended for synthetic carpet fibers, and not for wool, silk, or other premium rug fibers. If you’re new to rug or carpet stain removal, we highly recommend against experimenting with expensive, luxurious rugs, or be prepared to witness colors bleeding together, as well as rug fibers being damaged. Aside from that, there is a chance that the stain you were trying to eliminate can become set in the rug and become a permanent addition. Before you attempt rug or carpet stain removal, you should test for colorfastness. To do this, get a teaspoon of neutral detergent, for example, Ivory Liquid, Vel, or Lux. Dilute this in a quart of water, then dip in a clean white towel and make sure to wring it out completely, so that it isn’t soaking wet. Finally, press the towel to each color on the rug, just to make sure that you will have no color transfer onto your towel. Don’t rub the area—stick to blotting, because rubbing may press the stain further into the rug or cause texture distortion. Take note that some rugs are pretty heavy with bleeding/color run, and you have to be extremely careful and make sure that there’s no color running. If in case the colors do run, bring your rug to a professional rug-cleaner immediately. If there are no color runs, then you can try to carefully remove the stain. If your stain is any one of these, you can try a diluted solution of water and a mild detergent (the sort used to wash baby clothes.) Make sure that you call us when you realize that you need a professional job done! It’s important to minimize the damage by carefully blotting the stain using clean, white cotton towels. Work from the perimeter of the carpet stain, all the way to the center. Don’t rub the area: be patient and blot very gently, so that you don’t press the stain further into the pile. When most of the spill has been successfully absorbed, get a quart of warm water and add a teaspoon of neutral detergent and a teaspoon of white vinegar. The best kind of neutral detergent is one that is not acidic, nor alkaline. (Its PH balance is not 7.0) Then, grab a sponge and carefully apply small amounts of the solution onto the carpet stain. After the rug or carpet stain has been fully removed, get some cold water and apply this to the spot, and gently blot once more with a clean, white towel. When dealing with a particularly stubborn carpet stain that just refuses to come out, this is when you should depend on us at Pettyjohn’s Carpet Cleaning, where we are serious about the high quality of our carpet cleaning services. 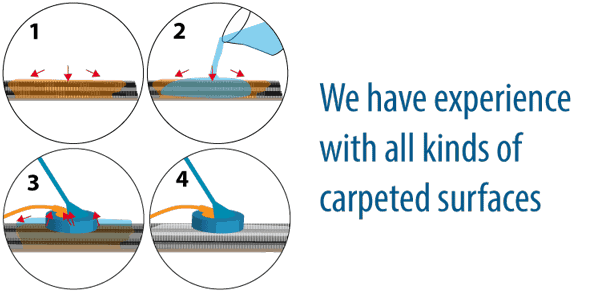 We have experience with all kinds of carpeted surfaces, so you can be sure that our employees know just the solution to deal with those unpleasant stains that may mar the beauty of your delicate rug. If you live in Wake Forest, Raleigh, Durham, Chapel Hill, Triangle, Fayetteville & surrounding areas in North Carolina, and need our help, do call us at 919-556-4641 or pay a visit our contact page. We also offer services in disaster restoration, tile and grout cleaning, wood floor cleaning and can apply a layer of protection on your area rug and carpets, and much more.